Today, making Icewine is a Canadian game, we may not have invented it but we have perfected it. Canada's Niagara region has the long, warm summers and cold winters that create the ideal conditions for Icewine. ** The Icewine harvest, done entirely by hand, commences once the temperature drops below -10 to -13 degrees Celsius and the grapes have naturally frozen on the vines. As the frozen grapes are pressed, the natural water portion of the juice remains within the grape skins in the form of ice crystals. A tiny but precious ration of highly concentrated juice is expressed. The Okanagan Valley in British Columbia also produces outstanding Icewines as do Nova Scotia and Quebec. The discovery of Icewine was accidental. Due to a cool summer and exceptionally cold winter in 1794, wine producers in Franconia, Germany, by virtue of necessity, created Icewine by pressing juice from frozen grapes. They were amazed by the high sugar concentration. It was not until the mid 1800's, however, that Icewine was intentionally made. This occurred in the Rheingau region. Grapes are left on the vine well into the winter months. The resulting freezing and thawing of the grapes dehydrates the fruit and concentrates the sugars, acids, and extracts in the fruit, thereby intensifying the flavours and adding complexity to the wine. This juice is then fermented very slowly for several months, stopping naturally. Genuine Icewine must be naturally produced; no artificial freezing is permitted. The icewine harvest, done entirely by hand, commences once the temperature drops below -10 to -13 degrees Celsius and the grapes have frozen naturally on the vines. As the frozen grapes are pressed, the natural water portion of the juice remains within the grape skins in the form of ice crystals. A tiny but precious ration of highly concentrated juice is expressed. The juice from wine grape is about one-fifth the amount you would normally get if you pressed unfrozen grapes. To put it another way, a vine will normally produce sufficient grapes to make a bottle of wine; but frozen grapes will produce only one glass of Icewine. This would explain the difference in price between the two. The finished Icewine is intensely sweet and flavourful in the initial mouth sensation. The balance is achieved by the acidity, which gives a clean, dry finish. The nose of Icewine recalls lychee nuts. The wine tastes of tropical fruits, with shadings of peach nectar and mango. The high sugar levels lead to a slower than normal fermentation. The signature of a great Icewine is the balancing tension between the sweetness and the acidity, with seductive tropical fruit flavours followed by a crisp, bracing finish which, when the wine is swallowed, is vividly refreshing. This brilliantly focused acidity distinguishes the icewine from sauternes and accounts for the freshness. * The finished Icewine creates a unique sensation on the palate. Typical grapes used for Icewine production are: Riesling Seyval Blanc, Vidal Blanc and, interestingly, the red grape, Cabernet Franc. Cabernet Franc Icewine is a light pink colour, similar to a Rosé wine. In 1973, Walter Hainle made the first (small scale) Icewine in Canada then in 1978, Hainle Vineyards produced the first commercially available Canadian Icewine. Today, Canada is the largest producer of this rare, rich and sweet ambrosia, with the lion's share coming from Ontario's Niagara Peninsula. The Okanagan Valley in British Columbia also produces outstanding Icewine, as do Nova Scotia and Quebec. The volume of Icewine produced in Ontario has risen phenomenally, commensurate with demand. Sales in vintages alone rose from 25,000 bottles in 1992-93 to an estimated 120,000 bottles in 1996-97. Sales continue to grow at a rate of over 50% per annum. The burgeoning demand is also evident in the export market - particularly in Asia where Ontario Icewines have fetched over three times the domestic price in Japan. * A 375ml bottle may sell for as much as $300.00 In Canada. The average price for a 375ml bottle of Icewine is around $45.00. For over 20 years, Europeans banned Canadian Icewine from their markets, stating high sugar content as their reason, t he ban was lifted in May, 2001. Hugh Johnson, author of World Atlas of Wines Niagara, has moved icewine from the fringe benefit for vintners to an international luxury item as dependable as it is luxurious. 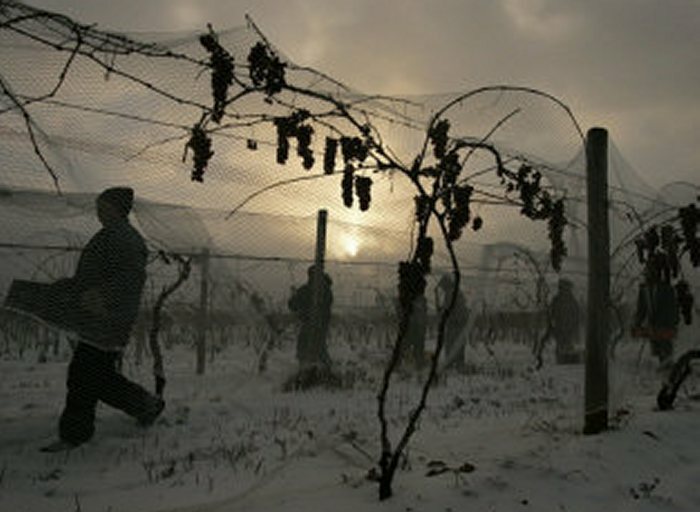 Global warming, climate change may produce warmer weather in the colder months wheni cewine is normally harvest. Grape growers will have to adapt to the changes. 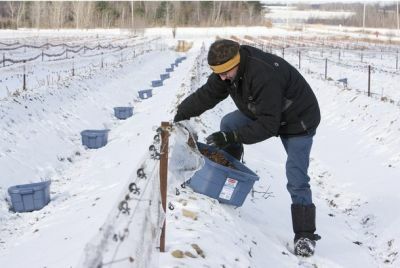 Inniskillin winemaker Bruce Nicholson said "the unpredictable whims of the Canadian winter mean any experienced vintner has dealt with everything from an ice-cold November to a balmy January.grape growers should be well-prepared to deal with any changing weather patterns using technology, grape selection and different harvesting methods."" Why is it more expensive than regular wine? First, grape growers take a huge risk by leaving the fruit on the vine long after the usual harvest time. Birds, animals and weather can all destroy the grapes as they sit waiting for the perfect conditions necessary to harvest grapes for Icewine. Second, the grapes must be processed so carefully and quickly once the conditions are met. Third, the juice may be sweeter but there is less juice in each grape compared to a fall harvest. How long can I keep a bottle of Icewine? With such a brief history, determining the ability of Icewines to improve with time is open to conjecture. Sweet wines must have good acidity to gain complexity, so good balance is essential for long-term storage. Icewines are so attractive when young that there are few examples to assess (and those are very expensive). The best method for choosing an appropriate icewine to cellar is to base your choice on the grape variety used to make the wine. Icewines made with the Chardonnay, Cabernet Franc and Merlot grapes should be drunk young. Gewürztraminer and Ehrenfelser can frequently be low in acid, and while they will keep for 3-5 years, they are not good candidates for the cellar. Vidal is good for 5-7 years, although Inniskillin Ontario has Vidal Icewines from the 1980's that are reportedly superb. Due to the high sugar content, an open bottle of icewine will last 3-5 days after opening if re-corked and stored in the fridge. Why this would happen is beyond me. In our house, once a bottle is opened it is considered gone from the cellar. Are there any other uses for Icewine? Icewines are very versatile. They have been blended with brandy to make liqueur, used to create exquisite jellies and have been used as ingredients (albeit expensive ones) in several cocktails. There are also numerous recipes that incorporate icewine. How is Icewine best served? Icewine shows best when it is chilled but not cold. The ideal temperature is - 10 to -12°C. Renowned as "dessert in a glass" it is ideal on its own or with a fresh fruit plate. Often, it is recommended that Icewine be served in small liqueur glasses, but research has shown that stemware with a fairly large bowl (9 oz.) is better, as it amplifies the nose and intensifies the flavours. Failing that, a normal wine glass is still better than a glass that is too small. Where can I buy Canadian Icewine? Unfortunately, we are unable to tell you which wine stores in your area carry Canadian icewine. The regulations for importing and exporting wine are controlled by the various States and Provinces in North America. Other countries around the world will also have their own trade regulations and liquor laws. How many bottles can I bring back to the USA? Each adult returning to the US is permitted one (1.5) litre (26 oz) of wine or spirits duty free after 48 hours in Canada. Duty on wines can vary from 15 cents to 45 cents per bottle. It is recommended that you retain your receipt and declare your purchase(s) at US Customs.